A robot block party, a cantankerous comedian, and dozens and dozens of daffodils round up this week&apos;s events! 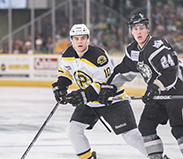 Start off your weekend with a hard-hitting game of hockey as the Providence Bruins take on the Worcester Sharks at the Dunkin&apos; Donuts Center. The game starts at 7:05 p.m.
Up Close on Hope is a program by the Festival Ballet Providence at the Black Box Theatre. This program focuses on first-time and veteran choreographers from around the world. Enjoy this production starting at 8 p.m. This week is National Robot Week, so in honor of this, Brown University is hosting the Rhode Island Robot Block Party. Check out hands-on exhibits, demos and displays from robotics companies, schools, universities and other nonprofit organizations. The Humanity Centered Robotics Initiative at Brown University and the nonprofit youth robotics organization, Rhode Island Students of the Future, are sponsoring this event. The party starts at 12 p.m.
Spring is here and Blithewold Mansion, Gardens & Arboretum is in full bloom! Come and see one of the most beautiful displays of flowers and horticulture in Rhode Island. Take a tour through Blithewold Mansion, learn about the Van Wickle/McKee family and view original furnishings. The tour starts at 1 p.m. Cheer up your Sunday with the ranting and raving of Lewis Black live at the Providence Performing Arts Center. Lewis Black is a Grammy Award-winning stand-up comedian, actor and author, and sells out venues around the world. Check out this amazing stand-up show starting at 7 p.m.